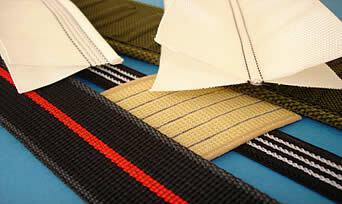 Our range of weaving is extensive, covering widths from 1/4” to over 40”. With both shuttle and shuttleless (needleloom) capability we have the flexibility to produce the appropriate woven products for your application. Our expertise in this area allows us to be a high quality, competitively priced supplier due to cost saved by making the product correctly at the loom. This is extremely important with the high cost of raw materials used in specialty applications. After the webbing is made, we can provide finishing including dyeing, UV protection, or a wide range of other specialty finishes. In addition to traditional flat webbings, we can produce products of unique shapes and profiles to meet your needs.